When I was at uni, I became very adept at saving money. Mostly because I was lazy and didn't want to get a job, admittedly, but I still managed to get through my four year course without an overdraft, working or borrowing money off family members. Despite this, I didn't feel as though I was missing out or not making the most of my experience. My uni days were filled with fun and excitement so today I'm sharing my tips on living the uni lifestyle without spending a fortune. Not everyone will have this option, and I certainly felt like I'd picked the short straw when I found out I'd been allocated this, but catered accommodation was a lifesaver. I paid a little extra rent and was given exactly £33 each week to spend on food in the uni canteen. Although I was grumpy about it at first, what this meant was that once I'd paid my rent, the rest of my loan was mine to spend as I saw fit, without worrying about how I was going to eat. One downside of the system at Winchester, where I studied, was that if you didn't use up the £33 by Monday morning, it would be wiped off and you wouldn't get it back. To get around this, we'd end up splashing out on Sunday afternoons and, if we went away for the weekend, we'd leave our catering card with friends so they could use up the remaining balance and treat themselves. Admittedly sometimes I'd spend too much at the beginning of the week and be stuck eating Marmite sandwiches (20p per slice of bread and 10p for a little packet of Marmite) for the rest of the week, but at least I knew my balance would be reset come Monday morning. We all know that sharing food and household items is the way to save cash at uni but think about other areas where you can split the cost. The girl in the room next door was on the same course as me so we'd go halves on those annoying hidden costs, like reading packs, that universities love to make compulsory. While on teaching placement, I asked if I could be placed in the same school as a friend who lived in my hometown so we could carshare and split the petrol money. Use your initiative and always think "Could I share the cost of this with someone else?" Being a bit cheeky can come in handy! I never got an NUS card but I still managed to get discounts by just asking for one. As I was training to be a teacher, I'd often mention that, especially if I was buying resources for my placements, and it's amazing how many times I'd be given a couple of quid off. Obviously you need to balance this carefully- workers in big chains won't have the authority to give you a discount and you'll need to consider the ethics of getting discounts from very small businesses. If you get the balance right though, it can be a very effective way of saving money. This is hardly groundbreaking but, seriously, get one! The amount of money I saved was ridiculous and, as most students will leave university at 22, you'll have at least another 3 years to use it after you've graduated. Tip: Buy a new card the day before your 25th birthday and you can extend the discount an extra year! Similarly to using your 16- 25 railcard, exploit your student status for all it's worth! I may not have got an NUS card but, if you do, get your money's worth out of it. Use the student union bar and take advantage of the cheap drinks. Get a student bank account and enjoy the benefits. Most people will only be a student for three short years of their life, so make the most of it while you can! Saving money doesn't have to mean nights in your slippers watching Corrie while your friends party. With a little bit of thought, you can live a full, active uni life without having to pay back thousands* once you graduate! *Erm... except for the £30-odd thousand in student loans, of course! I promise you won't even notice that once you start working, though. Don't stress about it! So true! I saved so much with my rail card but it means I hate paying full price for a ticket now! If you're not catered, don't go food shopping whilst hungry. Handwash small clothes items to cut down on washing machine costs. Also if lyou're capable of having good nights out stone cold sober, that saves a lot, 'cause alcohol is hella expensive. 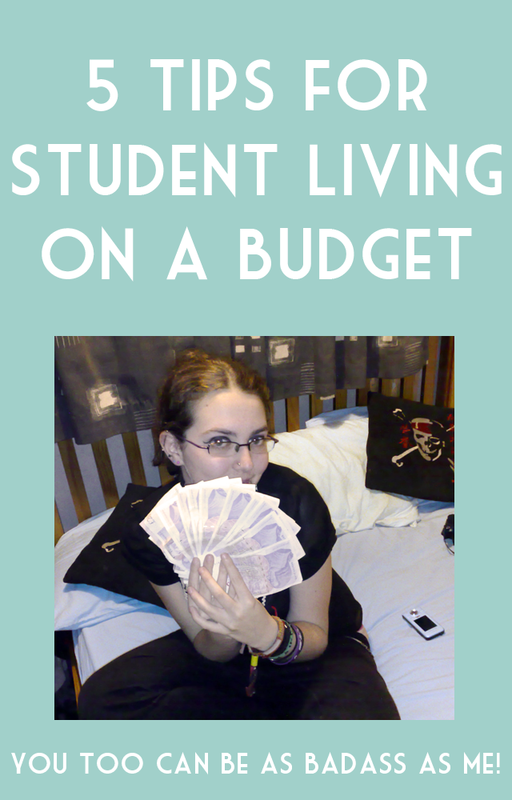 This is such a useful post, my first year of uni was almost ruined because of how bad I was at managing my money. It's such a culture shock to go from having no money to literally being in charge of everything!! I lived in catered accommodation for the first year and it was a saviour! I'm not a student myself but this was interesting to read. I'll share with some uni students I know. I've just started uni and literally the money situation is the worst, but these tips are all really handy! Santander are also offering the 16-25 railcard for free with their bank account so, y'know, bit of saving to be had there! My tip is to buy local produce from markets. In final year me and one housemate would buy fruit and veg from the local market which was SO much cheaper than any supermarket.